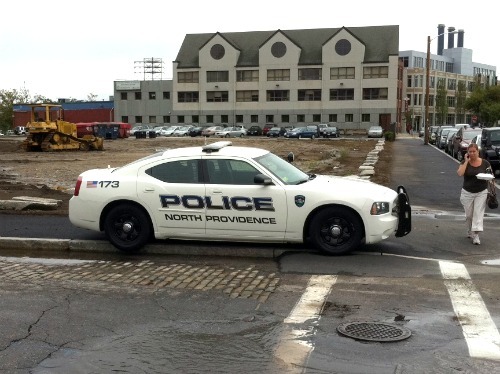 One would think that the North Providence Police would be aware of their PR problem, but that does not stop them from coming to Providence and parking their cars on our sidewalks. This is at Richmond and Clifford behind the courthouse, and to be fair (though really, there’s no excuse) the entire sidewalk on Clifford from Dorrance to Richmond is littered with cars; presumably driven by people going to court. Why this is allowed to happen when the Courthouse has a superblock sized parking lot behind it, which is never full, is beyond me. It’s not just NPPD, they ALL DO IT!!! They park all over the place by the Superior Court … in crosswalks, across side streets, in front of fire hydrants, you name it! 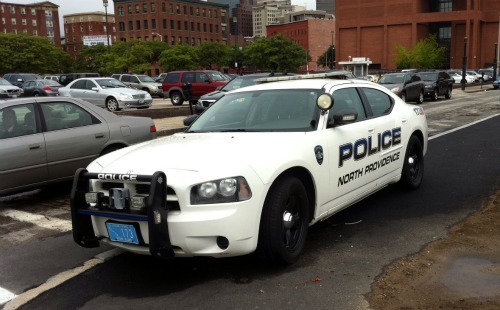 Went by one day last week and the entire sidewalk from Dorrance to Richmond was occupied by cruisers from all over the state including State Police. Another reason to build a garage at the court house there. To solve the parking problem, they should build a parking garage somewhere close. Oh wait…. A garage plus bollards along the curb. Lets not forget the news vans and employee vehicles along Benefit, College and Hopkins Streets when Providence County Court is in session. So much for more strictly enforcing the parking codes. parking on that freshly paved sidewalk (paved sidewalks??) is nicer than parking on that deteriorating half paved cobbled stone mess of a street.